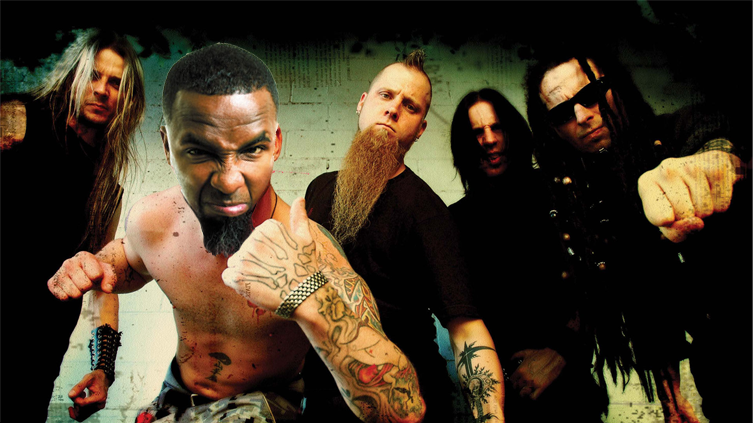 When your band is called Five Finger Death Punch, covering LL Cool J’s “Mama Said Knock You Out” seems preordained. The surprise isn’t that the five-piece metal ensemble decided to record a hip hop tune, but that it took them four albums to do it. When the band finally decided to put their stamp on the classic rap track, they found perfect person to help out: Tech N9ne. Although he was on tour, Tech N9ne jumped at the request. The only time his schedule would allow was the very un-rock-and-roll time of 8 a.m.
With the instrumental track complete and a scratch vocal track to provide direction, it didn’t take the Strange Music MC long to record his part. The hasty departure meant although they collaborated on tape, Spencer and Tech N9ne have still yet to meet face-to-face. Tech N9ne isn’t the only guest on the new Five Finger album. Judas Priest frontman and metal god Rob Halfort joined the band on lead single “Lift Me Up” and members of Soulfly, In the Moment and Hatebreed also appear. The Los Angeles-based band had the freedom to expand their boundaries when they realized they had more than enough material for one album. Instead of culling the material for one release, they decided to release it all in two parts. “The Wrong Side of Heaven and the Righteous Side of Hell, Vol. 1” came out in July. Volume two drops November 19. Spencer said the band consciously spread out the tempos and textures across both albums rather than creating a common theme for each volume. The recording studio can be a harsh master that will fray even the best of bands – look no further than the Beatles’ “Let It Be” – Spencer said his band emerged from the process even stronger. Thinking twenty-six songs and more than 90 minutes of new Death Punch material might be too much for fans to digest in one sitting, the band opted to pace releases. The glut of new songs also created issues when planning setlists. They may have nearly doubled their catalog this year, but Five Finger Death Punch aren’t resting on their laurels.